If those making decisions at the upper levels of government have a heart, how can we encourage them to listen to it? With so much distraction happening in the head and constant external pressure, listening to the heart isn’t always so easy to do. It requires taking a moment to stop, breathe, listen within, and the willingness to let go of the demands placed on us by our minds and others. Accessing the wisdom of the heart almost always involves clearing the mind. Elders remind us on White Buffalo Day to step back and consider the larger picture of our roles on this planet, our impact, and our potential to come together and make much needed changes. Clearly this can only happen if our political world leaders are listening as well. What will it take to call them back to the heart? White Buffalo is a story passed down for 19 generations in The Lakota Tradition with a beautiful vision of harmony between nations and healing for the land. Sounds like something we could really use right about now doesn’t it? The story speaks of a White Buffalo being born to send a warning to the people, but to also symbolize a great potential for change. If the people choose to wake up and return to living in a harmonious way with Mother Earth, miracles can happen. In 1994 a White Buffalo was born in Janesville, Wisconsin the same week of a historic a pipe ceremony in Congo Square in New Orleans. Regardless of coincidence or divine intervention, this was the beginning of White Buffalo Day. On August 27th every year around the world and in Congo Square, New Orleans people gather to consider the implications of this powerful idea. Congo Square is one of the birth-places of jazz and blues though it’s history to local natives predates the colonial era. It is a place where Native Americans and African Slaves traded, danced, and drummed freely thanks to progressive French Plantation Owners in the area. Nestled in the heart of The Treme Neighborhood made famous by the HBO series of the same name, Congo Square is also known as Louis Armstrong Park. Central to this story is a man named David “Goat” Carson. 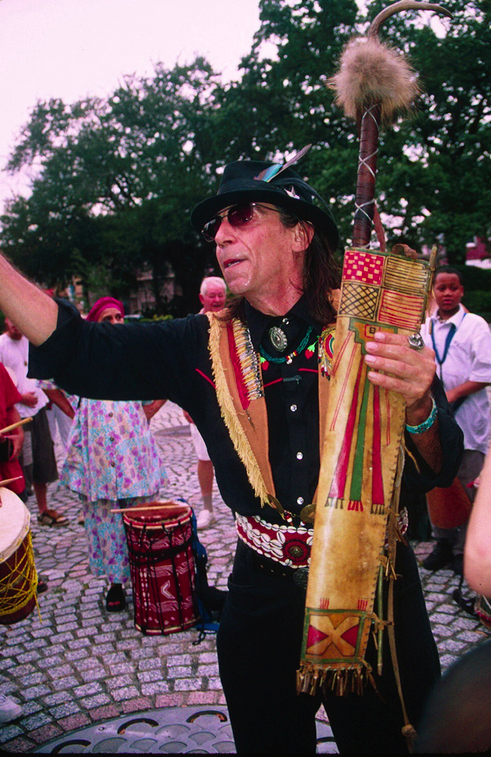 He is Cherokee elder, reverend, poet, musician, oral-historian, and community organizer in New Orleans. He has hosted The White Buffalo Day Celebration for 20 years. Carson is most known for his Grammy-Awarded songs performed by Dr. John and his thought-provoking social commentary masked in works of fiction like Shallow Graves. Respected Black Indian Chief, Allison “Tootie” Montana, is also central to the birth of White Buffalo Day in New Orleans. Black Indians have a hidden past and their blood lines stretch across continents. During times of slavery, Indians raided plantations and freed slaves. These varied African and Indian cultures mixed and inter-married, keeping aspects of their ancient indigenous heritage alive through their cultural ceremonies. Some of the bands of Indians that fled during the fall of Montezuma had migrated north and east around the gulf, others had migrated north and to the west. As these histories become known, the term “All My Relations” begins to make sense in a whole new way. The American Melting Pot pre-dates America as we know it today. David “Goat” Carson and Tootie Montana felt that it was time that some of these untold histories be celebrated in public with a pipe ceremony in Congo Square in late August of 1994. During that same week, thousands were gathered in the pine forests of Northern Arizona with Hopi, Havasupai, Apache, and many other traditional elders for council of Rainbow Nations. 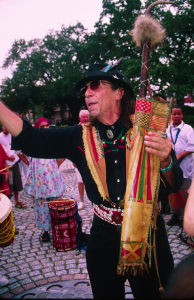 Drumming around The World had also been organized for that week with people in 38 countries and 42 US states all drumming simultaneously for Unity. None of the elders or organizers were aware of the others gatherings, this was before the days of cell phones and Facebook. The White Buffalo was born that same week in Wisconsin. Musicians like Cyril Neville, known for his soulful musical expressions of social justice, along with his wife Gaynielle have also participated in making White Buffalo Day special over the years. With a growing list of New Orleans cultural dignitaries and artists, the event has continued to be at the spiritual heart of the city, attracting people from all ethnic backgrounds to share a worthy vision. Always a small and spirited gathering of those who know and remember the old stories. In South Dakota, The 19th Generation Keeper of The Sacred White Buffalo Calf Pipe and Bundle today is Chief Arvol Lookinghorse. Lookinghorse, author of White Buffalo Teachings, is an advocate of maintaining traditional spiritual practices, founder of The Bigfoot Riders which memorializes the massacre of Big Foot’s band at Wounded Knee. Lookinghorse is also the founder of World Peace and Prayer Day. WHEREAS Chief Arvol Looking Horse, 19th Generation Keeper of The Sacred White Buffalo Calf Pipe of the Nakota, Dakota & Lakota Peoples of the Great Souix Nations and Honorary Citizen of his beloved… New Orleans has these words for the people of New Orleans & the world. If you have followed Idle No More, Forward on Climate, and One Billion Rising through the past few months you have noticed that many different movements are gaining momentum to end the abuses of indigenous communities, women, and the environment through acts of love, beauty and non-violence. Leaders throughout the world still appear to be sleeping in regards to our sacred obligation as human beings to the planet and each other. This is not a time for hollow words and rhetoric from our political leaders. Wars, corruption, colonialism, imperialism, greed, short-term personal gain, and ignorance are cluttering the minds of leaders everywhere. Perhaps together we can psychically nudge them to slow down and listen to their heart for just a moment. White Buffalo Day is August 27th but we invite you to hold this vision of healing, and unity alive every single day of the year. To learn more about and download PDF’s of previous proclamations, visit here. To listen to an NPR radio interview with Cyril Neville you can click here. In case you missed this story in last years Huffington Post piece about White Buffalo Day (which also has some more in-depth history), please take a moment and listen to the words of Chief Arvol Lookinghorse here.